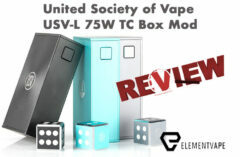 Packaging doesn’t usually rank high on my review priorities, but when spending hard-earned money on a new vape device, it helps to feel your money was used on something that offers quality and value – this puzzle-like, highly visual package does just that. 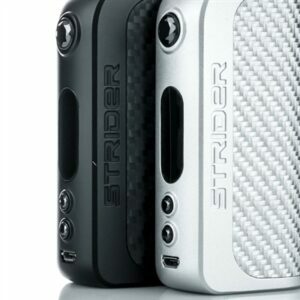 But, it’s what’s inside the box that matters, and the Asvape Strider is just as beautiful as the pictures illustrate. Removing the device from the angular foam and cardboard insert, you’ll be taken aback by the finely crafted, solid aluminum body. Not only does it have a noticeable heft, but the finish is equally comfortable. With a durable powder-coated paint job, and a carbon fiber backing, there is little doubt the Strider will be as durable as mods come. The Strider’s body is thick, but ergonomic, with curves that conform nicely to the grip in either hand. If you imagine a wider, more substantial take on Innokin’s Cool Fire IV, you’ll have a general idea of the Strider’s form factor. Atop the Strider is a rock-solid, press-fit 510 plate, measuring at 24mm, including fairly deep airflow channels built in. But these airflow channels don’t extend to the edge of the plate, making me question their usefulness in dissipating heat away from an atomizer. 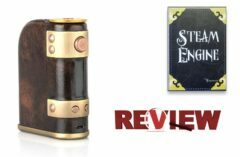 The brass-tipped and spring-loaded 510 connection accepted a wide range of tanks and RDAs from my collection, with only one not sitting flush – an older tank that has done the same in several of my other device reviews. Most modern tanks should have no problem fitting seamlessly on the Strider. The jewel-like fire button seems flimsy at first, but proved to be a firm, clicky interface, with no rattle, even after weeks of heavy use. The up/down controls have a similar feel, and are just as well built. The control scheme is completed by a 0.91-inch OLED glass display, and a bottom-positioned, front-facing USB port for firmware upgrades and onboard 2-amp charging. Finally, the bottom of the device features my only minor gripe about the Strider’s design – the threaded, screw-in battery cap. Though this design is arguably more reliable and sturdier than traditional hinged battery doors, I found the Strider’s cap to be stiff and difficult to remove. But it does have considerable venting holes throughout, which is always a positive for a higher-powered mod. Hopefully, you won’t need to swap batteries that often, as the Strider can accommodate either a single 26650 cell, or an 18650 using the included adapter tube. I did have a bit of trouble removing the adapter from the compartment on more than one occasion, but a few taps of the mod quickly rectified this. After the batteries were sorted out, five clicks brought up the Strider’s simplified menu, indicating this device, like the Michael mod, is powered by the company’s vaunted VO chipset. This offers users the option to operate the Strider in Power, TC, Bypass and the nifty VPC mode, which gives a variety of customized control options over the heating curves. 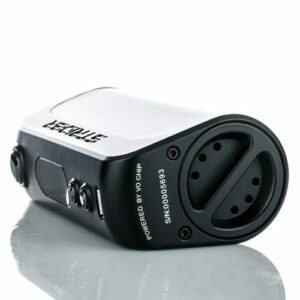 I found balanced mode to be just like traditional power/wattage use, but the other settings each had noticeable differences, and I can see finicky vapers finding a preferred mode from among these options. The menus are extremely familiar and efficient, with the usual three-clicks and long-presses to navigate and modify settings. Though most vapers will have no issue finding their way around these menus, the well-designed and -translated instructions walk newcomers through every step of operation. I should mention that the Strider mod also allows for customized wallpaper/logo designs for the screen, but the miniature display makes it seem somewhat silly on an otherwise mature-looking device. But, if you have a pixelated Deadpool logo to share, this is as good a place as any. I’ll say it again, the Strider feels phenomenal when vaping. 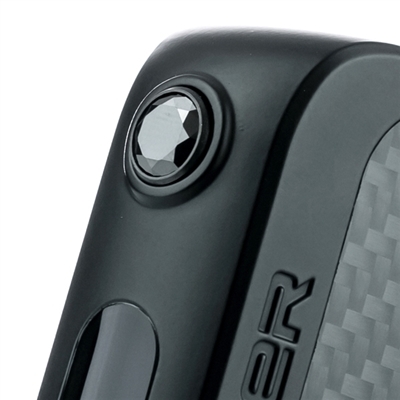 Even with a slick, carbon-fiber exterior, the mod never feels slippery in the hand, and the heft is reassuring. 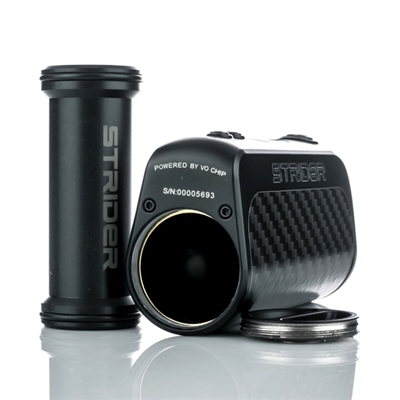 In my preferred wattage mode, the Strider was smooth and high-powered, with nary a bump in the road, even at the mod’s 75-watt limit. Ramp-up was fast, even with my lowest-resistance coils. At no point did the device slip under heavy use, with no misfires to be had. In temperature control mode, the Strider was equally high-performing. 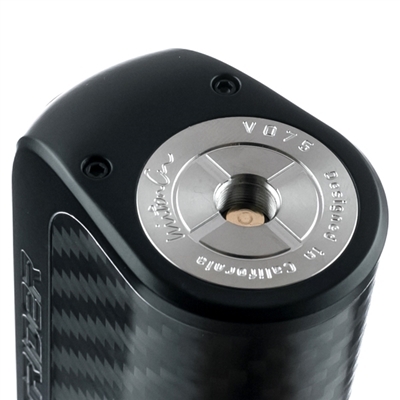 Using a titanium coil, reading near the bottom of the mod’s resistance limit at 0.08 ohms, the Strider quickly got up to speed, throwing massive, flavorful clouds in mere seconds. The Strider has a full suite of protection warnings in place, but never once did the device halt, even when pushing its extremes for temperature and resistance. 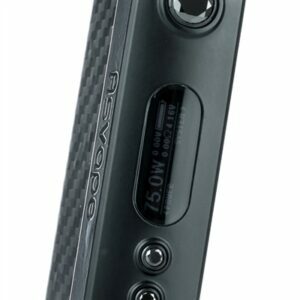 Bypass mode works well enough, with comparably smooth performance directly from the battery’s voltage. However, I did notice considerably lower battery life as a result. My thoughts on the viability of bypass modes on regulated devices notwithstanding, the Strider performs well under this setting, but have spare cells handy. VPC mode was certainly interesting. The afore-mentioned recommended settings each offered a unique vape experience, with only the Pulse mode bringing any gaps in performance. There, I found the momentary pulses to be erratic and detrimental to the smoothness of my draws. For quick, high-airflow hits, this mode might serve a purpose, but for those who enjoy longer, more-measured drags, one of the other settings will offer more impactful, flavorful vaping. When customizing VPC settings, the onscreen interface works well enough, but the small screen can make it difficult to determine the length of each point on the heating curve. More often than not, my vape quality diminished slightly from tweaking, and before long, I reverted to power mode to simplify the proceedings. Don’t let these little quirks deter you – I’m just not a “fiddly” vaper. Regardless of your preferences, you’ll find a mode on the Strider that suits you. Then, once it’s locked in, the device vapes beautifully. I just wish Asvape’s VO Editor software doesn’t include a control suite to more accurately modify VPC settings. Instead, it just allows for software and logo updates. I feel upgrading this software will help amplify the depth and power of this customization suite. Finally, the Strider demonstrated above-average battery life when using a 26650 cell, which gave me a full day of heavy vaping on one charge. Using an 18650 with the adapter sleeve wasn’t nearly as productive, bringing me just four hours of steady vaping before I began to see performance waver. The Asvape Strider is a gorgeous, high-performing mod that brings something to the table for every level of vaper. Yes, there are some concerns about the battery cap and the odd VPC settings display, but at the end of the day, the Strider delivers where it matters. 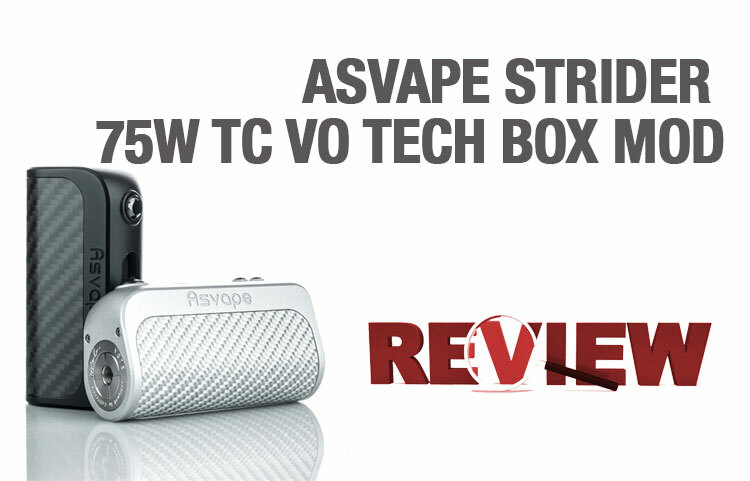 Once settings are dialed in, the Asvape Strider mod offers a powerful, reliable, altogether enjoyable vape that more than lives up to this company’s growing legacy.